Why I want to reduce my recycling in 2014. As recycling has become more and more available, I have watched my trash bin fill more slowly and have sent more materials in for recycling. 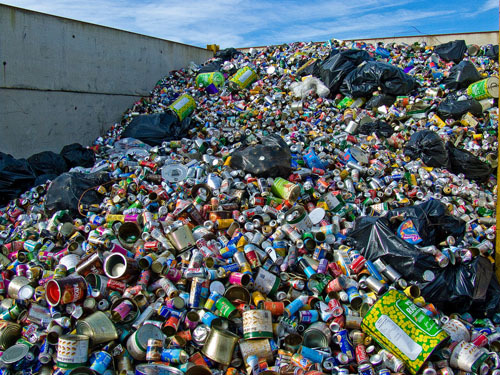 In many places recycling has become a part of our culture, and the US has seen an increase in the percentage of waste diverted from the landfill. According to this 2012 DEQ report, here in Oregon, we recover just over 50% of what could have ended up in the landfill, mostly through recycling and composting. This is a bit higher than the national average of 35%, so that’s something to be proud of. However looking at just a percentage doesn’t mean a lot if you don’t look at what it is a percentage of. We also need to consider the overall amount of waste produced. Looking at overall waste (including recycling and compost) is a good measure of our carbon footprints because it is a reflection of how many goods and products we are consuming, which all take energy and resources to produce. It is also a reflection of our consumer driven economy. Like the rest of the nation, we’ve seen a drastic increase in overall municipal waste since the 50’s with things leveling out around 2008 when the latest recession hit. The 2011 Oregon DEQ report shows waste on the rise again, with a slight increase in overall waste for 2012. So higher percentages of recycling aren’t as meaningful if there is an even bigger increase in overall waste. Expanding the scope of the EPA’s report, the Product Policy Institute took EPA’s National Emissions Inventory (NEI), subtracted out the emissions associated with exports and added in emissions associated with imports to the US. This provides a more accurate view of the emissions associated with goods used in the US. Under this global view of emissions associated with the US economy, overall GHG emissions are 12% higher than domestic emissions, and 44% of the total are associated with the production, transport, and end-of-life management of non-food materials alone. Add in the food we eat (and the food we waste), and that’s a really big part of our carbon footprints that isn’t talked about as much. So perhaps the quickest way to reduce your carbon footprint is by buying less stuff. Of course this is a contradiction to our current economic model, but that’s a topic for another time on steady state economies. I’ve noticed that the bulk of my trash and recycling comes from food packaging. Nationwide that’s about 30% of our overall waste. When it comes to necessary items like food, we need to make reductions by buying locally produced foods with less packaging. Here in Corvallis we have lots of great options for local food and items we can buy in bulk using reusable containers. Instead of buying durable products we may need new, we can look for it used or borrow it from a neighbor, again lots of great options here in Corvallis. I’ve been able to find almost everything I need used, from office supplies to electronics. So less items in your recycling bin is a good thing if it’s a part of an overall reduction in what you use.